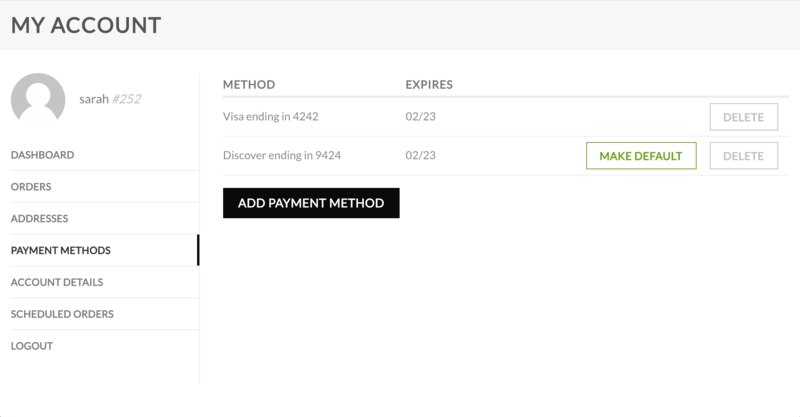 Autoship Cloud supports payment methods added by your WooCommerce customers at Checkout and within My Account > Payment Methods. Additionally, some payment gateways* can provide payment methods directly to Scheduled Orders using the "Load Methods from Gateway" feature when editing a Scheduled Order. *Note: this feature is currently supported for Stripe, Authorize.Net CIM and Braintree integrations. Note: different gateways will call the "Customer ID" by slightly different names, but for the most part this terminology will be very close to the ID you are looking for. Select the Payment method you would like to apply to the Scheduled Order and click "Update"
If your customer already has a saved payment method and Customer ID available to the Scheduled Order, you can load the available payment methods from their profile without needing to login to your Payment Gateway account. In addition to saving a payment method used at Checkout, WooCommerce Customers can add payment methods by logging into My Account > Payment Methods. Once a payment method is added by the Customer via My Account, the payment method is then available within your Payment Gateway and can be added to their Scheduled Order using either the "Load Manually" option or using an existing Customer ID (if available) when editing the Scheduled Order.